In 1839, the Treaty of London was drawn up and signed by the Kingdoms of The Netherlands and Belgium in recognition of and guarantee for the neutrality and independence of Belgium. Within a week of the outbreak of World War I in July 1914, the German Army launched its initial attacks on Belgium as a means of getting through to France, King Albert I of Belgium having rejected the German Emperor Wilhelm II’s ultimatum of 2nd August 1914 demanding free passage of German troops across Belgian territory. It was this invasion and its violation of the Treaty that contributed to bringing Britain into the War as it was a guarantor to the Treaty. There was considerable support for the Belgian nation and, following an offer of hospitality in September 1914 by the British Government to victims of the War, a good number of its citizens found refuge by escaping across the Channel to Britain and staying in towns and cities all over the country, each area being coordinated by a local Belgian Refugees Committee. One such committee was set up in Wimbledon and part of its role was to raise funds to support the influx of Belgians. The Treasurer of the Wimbledon Committee was Richardson Evans, a journalist and deeply committed conservationist who played a large part in expanding the boundaries of and establishing the large extent of land that is now Wimbledon Common and the impetus behind the creation of what is now the Wimbledon Society. The playing fields adjacent to Wimbledon Common are also named after him. All the national anthems were sung in English. News of the event even reached Australia where the Sydney Morning Herald included a report in its edition of 19th October as seen on the right. The Western Australian, in its report, had a sub-title of “An Interesting Ceremony”. As a follow-up to this, a concert was also planned for a month later, Monday 16th November, to celebrate the birthday of King Albert of Belgium. The concert took place in the Baths Hall in Latimer Road, Wimbledon but without the presence of the Duchess of Vendome as she had returned to Belgium to “visit Belgian soldiers in the field”. The opening work was a Prelude by Louis Spohr, played by the Wandsworth Borough Brass Band, and this was followed by the choir singing Beethoven’s Creation Hymn. After this came a trio of ladies to sing “Lift thine eyes” from Mendelssohn’s Elijah followed by the choir with “He that shall endure to the end shall be saved” from the same work. The rest of Part I was made up of a hymn by George Martin and music by Bach and Handel finishing with Zadok The Priest. How ironic that, the hymn aside, the whole of the first half consisted of music by composers of German origin. Once more Coleman Young was at the helm as conductor, some of the music in the second half being his own compositions. He clearly sensed a mood within the assembled singers that there was a desire to maintain the choral momentum gained over the previous couple of months. 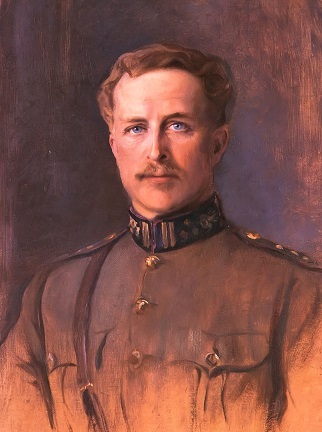 Richardson Evans was also of a similar mind in establishing a musical society and even proposed naming the group the Belgium Flag Chorus. Fortunately sense prevailed. A large number of those who formed the Choir … have expressed their desire to maintain their organisation on a permanent basis as a Society for the performance at intervals of important musical works. The first rehearsal was set for Monday 30th November in St George’s Hall, Wimbledon, with the proposed subscription rates of the princely sums of 5/- (25p) per annum for ordinary members and 2/6 (12.5p) for those already members of other existing Societies. The working title of the Society was set provisionally to 1914 Choral Society for Wimbledon and District, subsequently amended to Wimbledon 1914 Choral Society at a committee (the ‘Council’) meeting in February the following year. Dr Coleman Young was appointed the Society’s first Musical Director, Mr Theodore W Luling its first Chairman (later to become Chairman and President of London’s Moorfields Eye Hospital) and Richardson Evans became its first President. Even at that early stage there was the concept of also setting up a List of Subscribers, not so much for singing but for reserving seats at future concerts. The forerunner of the Friends of the Choir which operates today. To defray the cost of the performances, annual subscriptions are invited of not less than ten shillings which will entitle the subscriber to a reserved place (transferable) for each of the two concerts of the season. The remaining reserved places will be available for non-subscribers on payment of seven shillings and sixpence, and there will be unreserved places at half-a-crown and a shilling. The first concert took place on Monday 22nd March 1915 in the Baths Hall and the first work performed was Dvorak’s Stabat Mater. The evening even made a profit of £5 10s which was donated to the Belgian Refugees Fund. The next concert in November of that year included CHH Parry’s Blest Pair of Sirens with the composer as a guest of honour amongst the audience. In 1916 the Society suspended any further activity until the end of the War as more and more members were being called up for service or other activities. However, everything was restarted during 1919 and the first post-war concert was on Thursday 29th April 1920, featuring Samuel Coleridge-Taylor’s Hiawatha. The Society has continued to grow and gone from strength to strength ever since, celebrating its 100th anniversary with a special concert in the Royal Festival Hall on 30th March 2015, almost 100 years to the day since that first one. It is recognised as one of the finest symphonic choruses in the south-east. The history above relates to the current Society. However, old press clippings provide evidence of a Wimbledon Choral Society having existed in at least one form or another before 1914. The popularity of choral societies had been on the rise throughout the 1800s. The earliest reference found to date makes mention of the New Wimbledon Choral Society in the local newspaper The Surrey Comet on 12th November 1870 as seen to the left. The use of the word 'New' could be taken to imply that an even earlier incarnation may have existed. Other evidence shows the Society still existed in a stable form in 1873 although the 'New' had since been dropped from its title - see below. By this point, it would appear that the Society was being organised and run on a more formal basis with an appointed President, Conductor and Accompanyist (sic) with weekly rehearsals and a more ambitious performance repertoire than the part-songs that had been performed a few years earlier. That said, however, no other evidence has been found to suggest the Society continued operating after this date - indeed whether the proposed performance of Mendelssohn's Hymn of Praise did actually take place at all. The Surrey Comet newspaper, the prime source of the archive clippings used in this section, makes no mention of the choir thereafter until the early part of 1880, when it seems that the whole story started all over again with an entry in the same newspaper dated 14th February 1880 for a "First" meeting of the (new) Society the following Saturday 21st. The Mr F. (Frederick) Kingsbury referred to in the advert was a distinguished conductor of his time and, as seen, was also the Conductor of the Brighton Philharmonic Society as existed back then. Interestingly, the website of the current Brighton & Hove Philharmonic Society makes no reference to the earlier version of a similar name. The First Meeting was also a first rehearsal and a report in the South London Press newspaper dated 6th March 1880 suggests this was a successful start to the relaunched venture as, shortly thereafter, a notice was issued in the Surrey Comet on 20th March 1880 (below) announcing the first concert of the Society barely a month later on Monday 5th April 1880 in the local Drill Hall. The principal soprano soloist was Edith Wynne, a well-established Welsh opera singer of high renown. This concert was deemed to be so successful that a second one was scheduled for 31st May 1880, the advert for which (below) was also published in the Surrey Comet. The mezzo-soprano soloist was Mary Davies, a protege of Edith Wynne. However, the programme content of this concert is unknown as no subsequent press clippings have been found relating to it. Again, the Society seems to disappear - the only evidence of anything happening surfacing briefly in a reference to a performance of Handel's Messiah on 30th March 1888 and then it all goes quiet again for another 10 or so years. An entry in The Surrey Comet edition dated 18th March 1899 would suggest that the Society had lapsed yet again. Frederick Kingsbury died in February 1892 so it is possible the Society, as was, died with him. The 1899 clipping shown (right) refers to two other local choral societies, Kingston and Surbiton, which would appear to have been well-established by then, as well as the "newly established Wimbledon Choral Society" - again, it would seem, for the third traceable time. Whether the concert on 12th April 1899 was just a one-off or not is unknown as no other evidence has been found of the choir's continued existence thereafter. Despite the popularity of choral societies right across the country, the establishment and continued presence of such an association appeared to have been quite a challenge for Wimbledon in particular. It was not to be until the horrors of the opening months of World War I that another attempt was made to launch another version of the Society as detailed at the top of this page. Although the present Society's activities were suspended during periods in both of the World Wars, there would remain, finally, enough will to ensure that this time the Society continued to operate and flourish into the excellent group it is today. 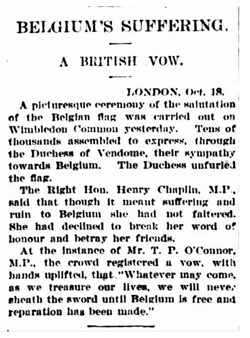 The original copy of the music A Salute to the Belgian Flag used in the Salutation to the Belgian Flag ceremony on Wimbledon Common on Saturday 17th October 1914 is held by the Wimbledon Museum and the image displayed when clicking on A Salute to the Belgian Flag in the History section is published with the Museum's permission under Licence. Similarly, the original copy of the audience programme booklet for the concert on Monday 5th April 1880 is held by the Wimbledon Museum and the image used here is published with the Museum's permission under Licence. All press clippings shown in the Pre-1914 section have been sourced from the British Newspaper Archive (BNA) available within the Genes Reunited website. They can also be accessed directly from the BNA website. The original source images (from which the extracts have been taken) are owned under © copyright by the British Library Board and are reproduced here within its terms and conditions on a purely non-commercial basis. All other records and documents are held in the Society's own archives.